Our Poetry Archive’s upcoming 2018 Anthology: OPA Anthology of Spiritual Poetry, Beyond Borders, will be a collaboration of poems directed toward spirituality. The topic may include, relate to, or consist of any spiritual matter of: spirit, soul, religion, spiritual morality, sacred matters, including meditation, devoutness, dedication, faith, etc. ; as well as spiritual qualities, tendencies, believes, perceptions, insights, and/or the overall expansion of the mind into a spiritual place and/or time. This editorial will focus upon cultural changes in belief systems and spirituality throughout literature; starting from the ancient period into the medieval period; emphasizing the similarities and differences between three epic poems: Hesiod’s Theogony, Virgil’s Aeneid, and Dante’s Inferno; in hopes of giving an example, explanation, and appreciation of spiritual poetry. Hesiod’s Theogony, Virgil’s Aeneid and Dante’s Inferno are three epic poems that focus on similarities and differences. Though beliefs differ in these epic poems, they all have a powerful source of a “Supreme Being,” they acquire a spiritual guide on their journey, and focus on an eternal afterlife. Enjoy the crossing of time, as we make our passage through epic brilliance. In our depictions of divinity, we humans have given form to our sense of the ultimate source of our own significance. When we give form to divinity, we derive that form from our own experience. We make gods in our own image because our own image marks the physical limits of our being. We cannot know the gods; we can only experience them (Leeming, D.A. 2014). So, spoke the fresh-voiced daughters of great Zeus/ And plucked and gave a staff to me, a shoot/ of blooming laurel, wonderful to see/ And breathed a sacred voice into my mouth/ With which to celebrate the things to come/ And the things which were before. They ordered me/ to sing the race of blessed ones who live/ Forever, and to hymn the Muses first/ and at the end. No more delays: begin (Damrosch D. & Pike D. 2008). It was the day’s end when from the highest air/ Jupiter looked down on the broad sea/ Flecked with the wings of sails, and the land masses/ Coasts, and nations of the earth. He stood/ On heaven’s height and turned his gaze toward Libya/ And, as he took the troubles there to heart/ Venus appealed to him, all pale and wan/ With tears in her shining eyes/ “My lord who rule/ The lives of men and gods now and forever/ And bring them all to heel with your bright bolt/ What in the world could Aeneas do/ What could the Trojan’s do, so to offend you/ That after suffering all those deaths they find/ The whole world closed to them, because of Italy (Damrosch D. & Pike D. 2008)? While Hesiod’s Theogony and Virgil’s Aeneid focus on the Greek divine myth of many gods, Dante’s Inferno focuses on one “Supreme Being,” the one and only God of the Christian belief. Dante’s Inferno states this fact in lines 1.127-29, “He governs everywhere, but rules from there/ there is His city, His high capital: O happy those He chooses to be there (The Divine Comedy of Dante Inferno, trans. Mandelbaum A. p.9). Though Dante focuses on the belief of one God, Virgil, whose epic poem revolves around the Greek gods, is his guide through his adventure through the gates of hell. Hell, being the opposite of the “happy” place in heaven, is where the two poets venture after Dante is forced to go back to the dark forest. “When I had journeyed half of our life’s way/ I found myself within a shadowed forest/ for I had lost the path that does not stray (The Divine Comedy of Dante Inferno, trans. Mandelbaum A. 1980). Dante saw the sun upon the mountain (the light of God in the upper world) but is forced back to endure the darkness of sin that the Christian faith speaks against in the Bible. It is in this dark forest that Dante meets the spirit of Virgil and begins the descent into hell (Limbo is the first circle of hell where Virgil exists). Dante must journey through hell to reach paradise and spend eternity with God, the Supreme Being. Then I will build you a solid temple/ Apollo and Diana, established hallowed days/ Apollo, in your name. And Sybil, for you too/ a magnificent sacred shrine awaits you in our kingdom/ There I will house your oracles, mystic revelations/ made to our race, and ordain your chosen priests (The Aeneid, trans. Fagles R. 6.83-88, p.184-185). In Dante’s Inferno, Virgil becomes the guide for Dante. He comes as a spirit to guide Dante into hell. Virgil is the perfect guide for Dante because he lives in Limbo and is also familiar with the inhabitants of hell. Virgil speaks to Dante, “I was a poet, and I sang the righteous/ son of Anchises who had come from Troy/ when flames destroyed the pride of Ilium/ But why do you return to wretchedness/ why not climb up the mountain of delight/ the origin and cause of every joy…Therefore, I think and judge it best for you/ to follow me, and I shall guide you, taking/ you from this place through an eternal place (The Divine Comedy of Dante Alighieri Inferno, 1980, 1.73-76, 1.112-114). Virgil then guides him through hell, so Dante can reach paradise. Another similarity in the three epic poems is the concept of the afterlife. In the Inferno, Dante’s journey takes him deep into the nine levels of hell, the afterlife of the Christian belief. Like Dante, Aeneas from Virgil’s Aeneid also journeys to the underworld in Book Six “The Kingdom of the Dead.” Aeneas is seeking out his father who passed on when they left Troy. Aeneas, like Dante faces many obstacles throughout his journey into the underworld. Hesiod’s Theogony also speaks of an afterlife. In his epic poem, the underworld or hell refers to Tartarus. Hesiod speaks of the Titans being thrown into the underworld, with a brief description of the terror of the dreadful place. Overshadowed the Titans, put them down/ in everlasting shade. Under the earth/ Broad-pathed, they sent them, and they bound them up/ in painful chains. Proud though the Titans were/ they were defeated by those hands, and sent/ to misty Tartarus, as far beneath/ the earth, as earth is far beneath the heavens (Damrosch D. & Pike D. 2008). There are many similarities between the Theogony, the Aeneid, and the Inferno, but there are some differences in the epic poems. The differences found, are due to the changes that occurred throughout Europe from the ancient period to the medieval period. Some of the differences are: in Greek mythology, mortals believed in more than one god, where as in Christian beliefs, there is belief in only one God. Another example is the cosmology of Hesiod. Hesiod gives explanation not only of the genealogy of the gods, but the creation of the universe and how the gods developed throughout the creation process. In Virgil’s epic, the gods are still active, and though Dante uses Virgil in his epic, Virgil was born before the birth of Christ and the establishment of Christianity. Also, in Greek mythology, the gods and the goddess possess human like traits like love and hate, lying and cheating, anger, and revenge. In Dante’s Inferno, he uses metaphor to give the traits of various sins and actions to animals. In conclusion, although Dante’s Inferno revolves around the Christian belief of one God, and Hesiod and Virgil’s beliefs revolve around many gods, there is still an established Supreme Being in all three epic poems. They also had a spiritual guide, whether it be a Muse, a Sybil, or the spirit of a man. Finally, they all had a concept of the afterlife. The differences in the three epics occur because of the cultural changes and development of the Christian faith. The comparison of the three epic poems are more similar than they are different, even though there is a change in the belief system. Voyage into Our Poetry Archive’s General Edition, May 2018, and experience the number of contributions provided by poets and poetesses across the world. Also, delight in the Poet of the Month, Eliza Segiet’s personal interview. Eliza Segiet has been a faithful contributor to OPA for a few years. It is a pleasure to read Eliza’s responses, and learn about the poetess herself. We thank you for your continued support and wish you remarkable success! 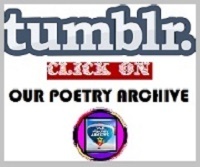 We also thank every contributor to Our Poetry Archive! Without your continued support, OPA would not be successful. 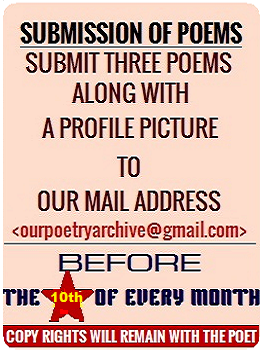 We appreciate and relish every penned word, from every poet, who contributes to the numbers of Our Poetry Archive! Thank you! ELIZA SEGIET: For me it is a mystery veiled in space. It is both a speech and silence, and sometimes a scream. In my opinion it gives a chance of a fictitious fulfillment of unrealized possibilities. Is is an opportunity to realize our perceptions and desires in ‘the best possible of worlds’. It is our thoughts written down that are still a kind of understatement, which gives a reader a chance for an individual outlook on poetry. ALICJA KUBERSKA: Co dla ciebie znaczy poezja? ELIZA SEGIET: Dla mnie jest tajemnicą, zawoalowaną przestrzenią, jest mową i milczeniem, ale czasami potrafi być też krzykiem. Według mnie daje możliwość fikcyjnej realizacji niezrealizowanych możliwości, jest szansą urzeczywistniania spostrzeżeń i pragnień w “najlepszym z możliwych światów”. To spisane myśli, które wciąż pozostają pewnym niedopowiedzeniem, co pozwala czytelnikowi na osobiste spojrzenie w głąb jej istoty oraz samego siebie. ELIZA SEGIET: It is a part of it, which does not mean that it is equally important for everybody. Today’s technological world often steals the time which might have been devoted to stop by verses of a poem. The pace of life is so fast that it’s difficult for a man to pause at poetry. Of course there are people for whom poetry is important, or even crucial. But unfortunately, like in one of the titles of our Nobel winner - Wislawa Szymborska: ‘Some like poetry’. I don’t know how much an approach to interpreting poems has changed at schools. Formerly students were imposed the only right interpretation (a famous Polish saying goes’ what the author had in mind’) Such an approach could only deter from that kind of literature. In my opinion a reader should look for and find himself in poetry, search for his feelings and sensations, his longing and desires. Alicja Kuberska: Co według ciebie oznacza poezja we współczesnym świecie? ELIZA SEGIET: Poezja jest jego częścią. Co oczywiście nie oznacza, że dla każdego jest ona równie ważna. Dzisiejszy, stechnicyzowany świat, często zabiera chwile, które być może można by poświęcić na zatrzymanie się przy strofach wierszy. Pęd życia uniemożliwia delektowanie się liryką. Oczywiście są osoby, dla których poezja jest ważna, ale niestety – jak w tytule jednego z wierszy noblistki – Wisławy Szymborskiej: “Niektórzy lubią poezję”. Nie wiem na ile zmieniło się w szkołach podejście do interpretacji wierszy. Dawniej narzucano uczniom jedyną właściwą interpretację (w Polsce słynne powiedzenie “co autor miał na myśli”). Takie podejście do tematu mogło zniechęcić do tego rodzaju literatury. Według mnie czytelnik powinien szukać siebie, szukać swoich odczuć, tęsknot i pragnień. ELIZA SEGIET: It happens that I walk wondering what to write. I look for an inspiration. Sometimes I need only a word, but just the very special one. The word, for unknown reasons, begins to live in me and I’m trying to embed it in a context. It does not mean that a poem will be created immediately after the word ‘has come’. It so happens that I bear it inside me knowing that sooner or later a longer text will come out of it. It was the case of words like: ‘aqueduct’, ’telepathy’, ‘stave’, or ‘last will’. They are not any sophisticated or weird words, but they became for me a canvas to particular poems. I’m not a person who can write custom made poems. I write when I feel afflatus. It is quite different with prose. Any theme can be an inspiration and any situation can be described I’m not scarce with words then, unlike poetry, in which I try to express myself through silence. I do realize that you can describe everything in a poem, too. To my mind a reader should be left some space to stop for emotions to sink in, for new associations and to stir imagination I call it ‘a space of silence’ which should be the content of unwritten thoughts simultaneously enabling the reader to build his own meanings. ALICJA KUBERSKA: Czy możesz opisać swój proces twórczy podczas pisania nowego wiersza? ELIZA SEGIET: Zdarza się, że chodzę zastanawiając się nad tym, co mam napisać. Szukam inspiracji. Czasami jest mi potrzebne tylko słowo, ale właśnie to jedno jedyne. Słowo, które z jakiś nieznanych powodów zaczyna we mnie żyć, próbuję je osadzić w jakimś kontekście. To nie oznacza, że wiersz powstanie natychmiast po tym kiedy słowo do mnie „przyjdzie”. Bywa tak, że noszę je w sobie, wiedząc, że wcześniej czy później będzie z niego dłuższy tekst. Tak było ze słowem „akwedukt”, „telepatia”, ”pięciolinia” czy „testament”. Nie są to żadne wyszukane czy dziwne słowa, ale to właśnie one stały się dla mnie tworzywem do konkretnych wierszy. Nie jestem osobą, która potrafi napisać wiersz na zadany temat, piszę kiedy poczuję coś, co niektórzy nazywają "weną". Zupełnie inaczej jest z prozą. Każdy temat może być inspiracją i każdą sytuację można opisać. Nie jestem wtedy oszczędna w słowach, zupełnie odwrotnie niż w wierszach, w których staram się wypowiadać także ciszą. Zdaję sobie sprawę, że w wierszu też można opisać wszystko. Moim zdaniem trzeba jednak pozostawić czytelnikowi przestrzeń do zatrzymania się by poczuć i odebrać emocje, nowe skojarzenia i poruszyć wyobraźnię. Nazywam to przestrzenią ciszy, która powinna być treścią niedopisanych myśli, a jednocześnie pozwala na własne (czytelnika) dobudowywanie znaczeń. ALICJA KUBERSKA: Did it happen to you that a poem was just your dream? ELIZA SEGIET: Yes, of course, for example ‘Life Occurred’ is such a poem. I was literally woken up by the phrase, I sat up and wrote a poem with it. Not only was I awoken by the poem but also by the necessity to scream out the pain of the people who survived the war and occupation times. In ‘Cloudiness’ I have a few poems that are called ‘war ones’ The theme occupied my mind to such an extent that a following poetic book (which is already in print) is dedicated’ In memory of Those taken by the Holocaust and Those who still remember it’. ALICJA KUBERSKA: Czy przydarzyło ci się, że wiersz ci się przyśnił? ELIZA SEGIET: A Man is the most often recurring theme in my literary output. He is the greatest inspiration: his experiences, joys, sorrows, his fight for survival and his understanding of the world. ’A Man in the world’ is still a mystery to me and that is why his voice is heard in my works. I write about accidental people met in the street, ordinary and yet extraordinary. Sometimes my attention is drawn to behavior which seems to be normal but, yet in a way it moves, surprises and makes me ponder and then makes me write a poem. I write also about Time, -about a man for whom Time is the beginning and the end of everything. Inexorably each of us has less and less of it to make advantage of. There are also poems about love, sometimes the true one which has a chance to occur, or the imagined one. Recently (as I have already mentioned) I have been writing ‘war poems’. The need arose in me to speak on behalf of these for whom the time has given out and they no longer can voice themselves, as well as those who are still alive and have survived this most horrible of al time nightmare of Mankind. ALICJA KUBERSKA: Opowiedz nam o swoich inspiracjach. Jakie są dla ciebie najważniejsze tematy? ELIZA SEGIET: Człowiek jest tematem, który najczęściej pojawia się w mojej twórczości. To właśnie On jest dla mnie największą inspiracją. Jego przeżycia, radości i smutki, walka o przetrwanie i próby zrozumienia świata. „Człowiek w świecie” wciąż jest dla mnie tajemnicą i dlatego oddaję mu głos w mojej twórczości. Piszę o ludziach przypadkowo spotkanych na ulicy, o zwykłych, a jednak niezwykłych. Czasem przykuwają moją uwagę jakieś zachowania, które być może nie odbiegają od norm, ale w jakimś stopniu poruszają, zadziwiają i skłaniają do refleksji, a następnie do napisania wiersza. Piszę też wiersze o czasie - o człowieku, dla którego czas zawsze jest początkiem i końcem wszystkiego. Nieubłaganie każdy z nas ma go coraz mniej do wykorzystania. Są też wiersze o miłości, czasem prawdziwej, która ma szansę się przydarzyć, a czasem wyobrażonej. Ostatnio - jak już wcześniej wspomniałam – piszę wiersze „wojenne”. Obudziła się we mnie potrzeba przemówienia w imieniu tych, dla których czas się skończył i nie mogą już zabrać głosu, ale też tych, którzy jeszcze żyją, a przeżyli ten najstraszniejszy w dziejach ludzkości koszmar. ELIZA SEGIET: Once I thought that I wrote about love. Now I know that they were poems about how we imagine love. MARIA MIRAGLIA: Jakie emocje zainspirowały twoje pierwsze wersy? ELIZA SEGIET: Kiedyś myślałam, że pisałam o miłości. Dzisiaj wiem, że to były wersy o jej wyobrażeniu. 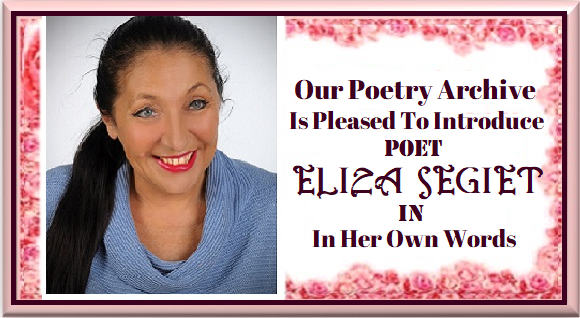 ELIZA SEGIET: I have never aspired to being a poetess. Was it just a coincidence? I don’t know if it might have happened by chance, but it happened. Maybe it’s good? MARIA MIRAGLIA: Czy miałaś aspiracje żeby zostać poetą, czy stało się to przez przypadek? ELIZA SEGIET: Nigdy w życiu nie miałam aspiracji żeby być poetą. Czy to stało się przypadkiem? Nie wiem czy to mogło stać się przypadkowo, ale się stało. Może to dobrze? ELIZA SEGIET: There is such a person, in fact the only one I mail my each poem. I know that the opinion I will get will be a sincere one. I have also a friend I phone and read my poems to, and I also know I can count on some impartial words. And there is, of course, ‘a call to a friend’, and this is my mum. However, when she reads my ‘war poems’ she is deeply moved and wonders why I choose such themes. MARIA MIRAGLIA: Kto jest pierwszą osobą, której czytasz swoje wiersze i dlaczego? ELIZA SEGIET: Jest taka osoba, do której - w zasadzie jako jedynej - mailem wysyłam każdy napisany wiersz. Wiem, że zawsze dostanę szczerą opinię. Mam też koleżankę, do której dzwonię, czytam i wiem, że też mogę liczyć na kilka obiektywnych słów. I oczywiście telefon do przyjaciela, a jest nim moja mama. Chociaż kiedy Jej czytam wiersze “wojenne” bardzo się wzrusza i zastanawia dlaczego wybieram takie tematy. MARIA MIRAGLIA: Czy opublikowałaś jakąś poetycką antologię, jeśli tak, co czułaś kiedy po raz pierwszy dostałaś ją w swoje ręce? ELIZA SEGIET: I like reading different poets Finding beauty( also in poetry) always requires numerous pursuits. I wouldn’t like to give names. There are, of course, poets I like to go back to but none of them has been an inspiration. MARIA MIRAGLIA: Kim są poeci, których lubisz czytać? Czy czerpiesz z nich inspirację? ELIZA SEGIET: Lubię czytać wiersze różnych poetów. Znalezienie piękna (również w poezji) zawsze wymaga wielu poszukiwań. Nie chciałabym operować nazwiskami. Oczywiście są poeci, do wierszy których lubię wracać, ale żaden z nich nie był dla mnie inspiracją. ELIZA SEGIET: An answer to the question is very difficult. After all, what is understandable to me may not be understandable to others. Moreover, to my mind in poetry you should try to find yourself and not look for the answer to ‘what the author had in mind’, Everybody has the right to read a poem according to his own way of seeing the world. There are people for whom my poems are understandable, but it happens otherwise, too. A line of my poem can mean something totally different to me and my reader. I reckon this is what makes poetry-beautiful- a multilevel interpretation. APRILIA ZANK: Jak ważna jest dla ciebie dostępność znaczenia? Czy rzucasz wyzwanie czytelnikom, aby ciężko pracowali, aby odszyfrować twoje wiersze, czy wolisz przejrzystość znaczenia? ELIZA SEGIET: Na to pytanie jest bardzo trudna odpowiedź. Przecież to, co jest czytelne dla mnie wcale nie znaczy, że będzie czytelne dla wszystkich. Ponadto - według mnie - w poezji trzeba szukać siebie, a nie tego, „co autor miał na myśli”. Każdy ma prawo odczytywać wiersz według swojego sposobu widzenia świata. Są osoby, dla których moje wiersze są zrozumiałe, ale oczywiście jest też odwrotnie. Dla kogoś jakaś fraza z mojego wiersza może znaczyć zupełnie coś innego niż dla mnie. Myślę, że właśnie to w poezji jest piękne – wielopoziomowa interpretacja. ELIZA SEGIET: As I have mentioned above, I write mostly about a man, and each man is unique, has his past, his joys, sorrows, dramas and uncertain future. The World War II has been a recurring theme recently. I’m trying to leave the subject but I find it difficult. APRILIA ZANK: Jakie wiersze głównie piszesz? Czy masz powtarzające się motywy, czy też twoje wiersze są wyjątkowe? ELIZA SEGIET: Jak wcześniej wspomniałam, piszę wiersze przede wszystkim o człowieku, a każdy człowiek jest wyjątkowy. Ma swoją przeszłość, swoje radości, smutki, dramaty i niepewną przyszłość. Ostatnio powtarzającym się tematem jest druga wojna światowa. Próbuję od niej odejść, ale jakoś jest mi trudno. ELIZA SEGIET: If I wrote poems about flowers, cooking, fishing, my works could surely be ascribed to a certain group of readers. 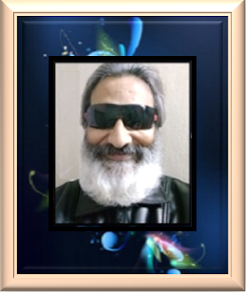 But since the poems are about a man, both men and women can read them Anyway, the opinion about my poetry I prefer to leave to the critics It is hard for an author to answer such a question. APRILIA ZANK: Czy uważasz, że twoja poezja jest typowo kobieca/ męska ? Jeśli tak, w jaki sposób? ELIZA SEGIET: Gdybym pisała wiersze o kwiatach, gotowaniu, wędkowaniu pewnie można by zakwalifikować moją twórczość do jakiejś konkretnej grupy czytelników. Ale pisząc wiersze o człowieku to sądzę, że mogą je czytać zarówno kobiety jak i mężczyźni. Chociaż opinie na temat jaka jest moja poezja, wolę pozostawiać krytykom literackim i czytelnikom. Autorowi trudno jest odpowiedzieć na takie pytanie. ELIZA SEGIET : About myself? No, I don’t write about myself Of course there are a few poems where a part of me can be found. I definitely write about a man entangled in problems of different nature. APRILIA ZANK: Czy piszesz głównie o sobie czy też masz otwarte oko/ ucho na problemy świata? ELIZA SEGIET: O sobie? Nie. Nie piszę o sobie. Oczywiście jest kilka wierszy, w których można odnaleźć cząstkę mnie, ale rzadko. Zdecydowanie piszę o człowieku uwikłanym w problemy różnej natury. ELIZA SEGIET : I cannot tell. There are people who say it is recognizable, different. I am trying not to write empty sounding words just to call them poems. Sometimes it seems to me a poem has a meaning, but it might be just my projection, just like it was with the first poems about love. APRILIA ZANK: W jaki sposób twoja poezja różni się od poezji innych poetów? ELIZA SEGIET: Tego nie umiem powiedzieć. Są tacy, którzy mówią, że jest rozpoznawalna, że jest inna. Staram się nie pisać pusto brzmiących słów, tylko po to by nazwać je wierszem. Czasem wydaje mi się, że mój wiersz ma jakieś znaczenie, ale ono może być tylko jego wyobrażeniem, jak było z pierwszymi wierszami o “miłości”. ELIZA SEGIET: First of all, a poem must be about something, maybe even something unique, worth writing about. A choice of words is also important, words understandable to most readers. In my opinion poetry should be an act of creation and not production. It is the quality of a poem that is most important and not the number of poems published. LEYLA IŞIK:  Jakie są główne czynniki, które tworzą prawdziwą poezję ? ELIZA SEGIET: Przede wszystkim wiersz musi być o czymś, może nawet o czymś unikalnym, wartym zapisania. Ważny jest też dobór słów zrozumiałych dla większości czytelników. Moim zdaniem poezja powinna być twórczością, a nie produkcją. To jakość wierszy, a nie ich ilość jest najważniejsza. ELIZA SEGIET: Of course, imagery is the essence of poetry. With the use of specific poetic means we can make the reader get the insight into poetry. An image is like a sparkle, it brings about associations, emotions. Surely there are poems addressing the reader in most direct ways, not leaving any space for the recipient’s imagination. But is it truly poetry? After all, we get the greatest satisfaction not only from a beautiful verse, but mainly from ‘breaking the code’, that is an understanding on the author- text- reader line. LEYLA IŞIK: Czy uważasz, że obraz jest ważny w poezji? Gdzie zaczyna się istota obrazów w wierszu, gdzie się kończy? ELIZA SEGIET: Oczywiście, obrazowanie to istota poezji. To za pomocą konkretnych środków poetyckich możemy dotrzeć do wnętrza czytelnika –Jeden obraz jest jak iskra zapalna, przywołuje skojarzenia, budzi emocje. Oczywiście są też wiersze mówiące do czytelnika wprost, nie pozostawiające miejsca dla wyobrażeń odbiorcy, tylko czy to faktycznie jeszcze poezja? Przecież największą satysfakcję dają nie tylko piękne frazy, ale przede wszystkim złamanie "kodu" - zawiązanie porozumienia na linii autor - tekst - czytelnik. ELIZA SEGIET: There are lots of poems written in Poland (maybe even more are written than read) Polish authors write really about everything using all possible means of poetic notation. 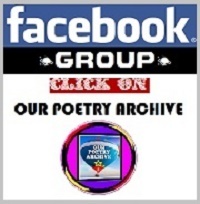 We can find personal poems and politically involved ones, serious and humorous ones, telling stories directly and with meanings hidden under various masks. Everybody is looking for his own ways to express what is inside him and around him. More and more often we are encountering experimental lyrics which is, no doubt, the result of pursuing originality and the need to stand out from the sea of contemporary literature. LEYLA IŞIK: Jakie są najczęściej używane rodzaje poezji w twoim kraju? ELIZA SEGIET: W Polsce pisze się dużo wierszy (być może nawet więcej się pisze niż czyta). Polscy autorzy piszą naprawdę o wszystkim, korzystając z każdej metody poetyckiego zapisu. Znajdziemy tu wiersze osobiste i politycznie zaangażowane, poważne i żartobliwe, utwory opowiadające wprost i sensy ukryte pod rozmaitymi maskami. Każdy szuka swojego sposobu na wyrażanie tego, co w nim i wokół niego. Coraz częściej spotykamy się z liryką eksperymentalną, co zapewne jest efektem dążenia do oryginalności, potrzeby wyróżniania się w oceanie współczesnej literatury. LEYLA IŞIK: What’s important to be a good poet? To write good poems! ELIZA SEGIET: I think a talent and industriousness are basic. Of course one should read a lot to acquire a literary taste and be able to tell good literature form the bad one. LEYLA IŞIK: Co jest ważne, aby być dobrym poetą? Aby pisać dobre wiersze? ELIZA SEGIET: Sądzę, że podstawą są dwie sprawy talent i pracowitość. Oczywiście trzeba także dużo czytać, aby wyrobić sobie smak literacki i móc odróżnić literaturę dobrą od złej. LEYLA IŞIK: Who are the most important poets and their main properties nowadays? ELIZA SEGIET: For me a great poet, not only a contemporary one is measured by the possibility of quoting him and his thoughts. If a poet succeeds in it, it means his thoughts are important not only to him but to the world. The truth is the world remembers the few, and if a part of literary output will be quoted anywhere, then in a sense the poet’s name and his thoughts have a greater chance to survive. LEYLA IŞIK: Kim są najważniejsi współcześni poeci i ich główne cechy? ELIZA SEGIET: Dla mnie miarą wielkości nie tylko współczesnego poety jest możliwość cytowania jego myśli. Jeżeli jakiemuś poecie się to udało to znaczy, że jego myśli są ważne nie tylko dla niego samego, ale dla świata. Tak naprawdę świat zapamiętuje niewielu, a jeżeli jakaś część twórczości będzie gdziekolwiek zacytowana to w pewnym sensie nazwisko i myśl autora też mają większą szansę na przetrwanie. DEBORAH BROOKS LANGFORD: Understanding poetry begins with visualizing the central images in the poem. What do you see, taste, smell, hear, and feel? What is the, imagery of your poetry? ELIZA SEGIET: Building a particular poem depends on its message. I do not have a single pattern of writing. My mode of utterance depends on what I want to say. Most of all, I am trying to reach the reader’s’ inside’, his feelings, experience, associations. I use such means that provide the expected emotional response. DEBORAH BROOKS LANGFORD: Zrozumienie, poezji zaczyna się od wizualizacji centralnych obrazów w wierszu. Co widzisz, smakujesz, wąchasz, słyszysz i czujesz? Jakie są obrazy I metafora twojej poezji? ELIZA SEGIET: Budowanie konkretnego wiersza uzależnione jest od przesłania. Nie mam jednego schematu pisania. Sposób wypowiedzi zależy od tego, co chcę powiedzieć. Staram się przede wszystkim docierać do głębi czytelnika, do jego uczuć, doświadczeń, skojarzeń. Używam tych środków, które dostarczą mi spodziewanej reakcji emocjonalnej. ELIZA SEGIET: In fact I have answered the question earlier. My poetry is primarily an emotional play. My imagery is to trigger an avalanche of associations, and these are to set in motion feelings which will possess the reader. ELIZA SEGIET: Właściwie na to pytanie odpowiedziałam już wcześniej – moja poezja to przede wszystkim gra emocji. Moje obrazy mają uruchomić lawinę pewnych skojarzeń, a te wprawić w ruch uczucia, które zawładną czytelnikiem. ELIZA SEGIET: The Man is the persona of my poems (as a symbol of all people) His image changes depending on what he is saying, once he is a war veteran, then a philosopher, and some other time a woman recalling her past. In my poetry I always address a reader, in fact it is the poem’s subject or / and the protagonist who create the bond with the reader. DEBORAH BROOKS LANGFORD: Kto w twojej poezji jest podmiotem lirycznym wiersza? Czy mówisz do siebie czy do innych? ELIZA SEGIET: Podmiotem lirycznym moich wierszy jest Człowiek (jako symbol wszystkich ludzi). Jego wizerunek zmienia się w zależności od tego, o czym się mówi. Raz jest weteranem wojennym, raz to mała dziewczynka, niekiedy filozof, innym razem znów kobieta wspominająca przeszłość. W swojej poezji zawsze mówię do czytelnika, właściwie to podmiot lub/i bohater wiersza tworzą więź z odbiorcą. ELIZA SEGIET: My mission is to tell about something important: for me, for an individual man, for the world. I hope that my readers find a part of themselves in my poems, that my persona shares with the reader some experience, emotions, that he shows that nobody is alone with his problems. I have the courage to speak about inconvenient and painful things. I speak out when others are silent. I am trying to make my poems the media of historic memory (in case of my’ war poems’). DEBORAH BROOKS LANGFORD: Jakie jest przesłanie twojej poezji. Jakie przesłania niesie twoja poezja? ELIZA SEGIET: Moją misją jest opowiadać o czymś ważnym – dla mnie, dla pojedynczego człowieka oraz dla świata. Mam nadzieję, że w moich wierszach czytelnicy odnajdują część siebie – że mój podmiot dzieli z czytelnikiem pewne doświadczenia, emocje, że pokazuję, że nikt nie jest samotny ze swoimi problemami. Mam odwagę podejmować tematy niewygodne i bolesne. Mówię głośno o tym, o czym inni milczą. Staram się, by moje wiersze były też nośnikiem dziejowej pamięci (w przypadku moich "wierszy wojennych"). ELIZA SEGIET: Definitely the Internet and social media help to come into being in the world. But success depends on poetry and not on the Net. I would never even think of writing in the view of ‘coming into being’ on the Net. I can add here that when my first poetic book was published, my name didn’t appear on the Net. Nobody had seen my single poem before the first volume was published. I had a few poetry reading evenings after the publication and then my name started to live on the Net. But I was not yet on any social media portals. Reportedly, I did not exist. I felt good, even very good about it. Some people tried to talk me into publishing on the Net but I did not even want to hear about it until I met Katy Carr, a British singer who managed to persuade me to register on FB. Now, after a few years I can say that if it hadn’t been for the Net, my poems would not have had the chance to be available all over the world. Or at least not so fast. DEBORAH BROOKS LANGFORD: Czy internet i media społecznościowe przyczyniają się do sukcesu Twojej poezji? Czy jest to powód dla którego piszesz? ELIZA SEGIET: Zdecydowanie Internet i media społecznościowe pomagają w zaistnieniu w świecie. Ale sukces zależy od jakości poezji a nie od Internetu. Nigdy nawet bym nie pomyślała żeby pisać po to aby zaistnieć w sieci. Mogę dodać, że kiedy opublikowałam pierwszą książkę poetycką nie było mojego nazwiska w Internecie. Przed moją pierwszą publikacją nikt nie widział żadnego mojego wiersza. Po opublikowaniu książki miałam kilka spotkań autorskich i moje nazwisko zaczęło się pojawiać. A ja nadal nie byłam w żadnych mediach społecznościowych. Podobno “nie istniałam “, było mi z tym dobrze, nawet bardzo dobrze. Kilka osób namawiało mnie żebym zaczęła publikować jakieś wiersze w sieci, a ja nawet nie chciałam o tym słuchać. Do momentu kiedy na swojej drodze życia spotkałam Katy Carr – brytyjską piosenkarkę, której udało się namówić mnie na zarejestrowanie się na FB. Teraz po tych kilku latach mogę powiedzieć, że gdyby nie Internet pewnie moje wiersze nie miałby szans być dostępne na całym świecie. A przynajmniej nie tak szybko! ELIZA SEGIET: It is me who wants to thank you for inviting me to the interview. As fate would have it, sometimes somebody reads the interview first and then gets interested in the author’s works. I think that OPA gave me the chance to present myself not only through my literary output but also from the other sideJ OPA is an Internet magazine of a wide range. 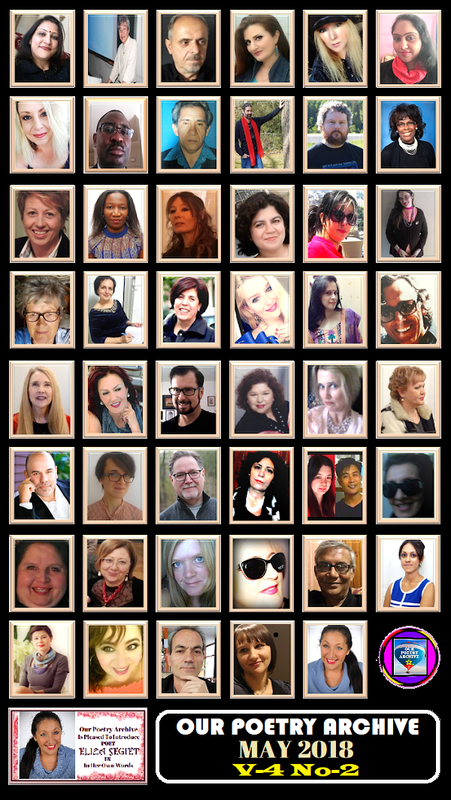 Poems published in it are diverse and valuable, and what is most important, the magazine attracts poets from the whole world and not just one region. I am very happy that OPA enabled me to publish. Now I am a part of a Great Family. 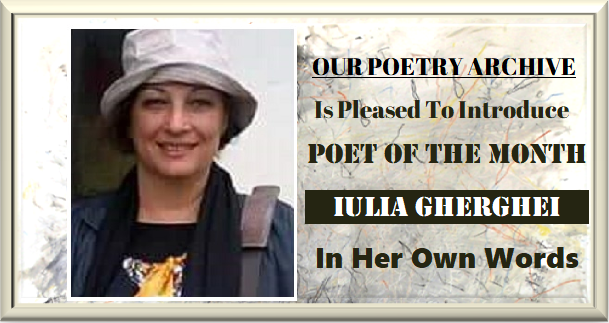 Many thanks to NILAVRONIL SHOOVRO and all the members of the ’Indian house for the world poetry ‘. NILAVRONILL SHOOVRO: Bardzo dziękuję za wywiad. Chcielibyśmy poznać twoje osobiste doświadczenia z OPA jako literackiego czasopisma internetowego. Czy chciałabyś podzielić się czymś więcej z naszymi czytelnikami? ELIZA SEGIET: To ja bardzo dziękuję za zaproszenie do tego wywiadu. Bywa tak, że ktoś przeczyta wywiad, a dopiero później zainteresuje się twórczością danego autora. Myślę, że OPA dała mi szansę na pokazanie siebie nie tylko poprzez twórczość, ale również z innej strony. OPA to czasopismo internetowe o bardzo szerokim zasięgu. Zamieszane wiersze są wartościowe i różnorodne, a co najważniejsze gazeta przyciąga poetów z całego świata, a nie z jakiegoś konkretnego regionu. Bardzo się cieszę, że OPA umożliwiła mi publikacje. Teraz jestem częścią wielkiej Rodziny. Dziękuję NILAVRONILL SHOOVRO i wszystkim Współpracownikom “indyjskiego Domu dla poezji świata”.